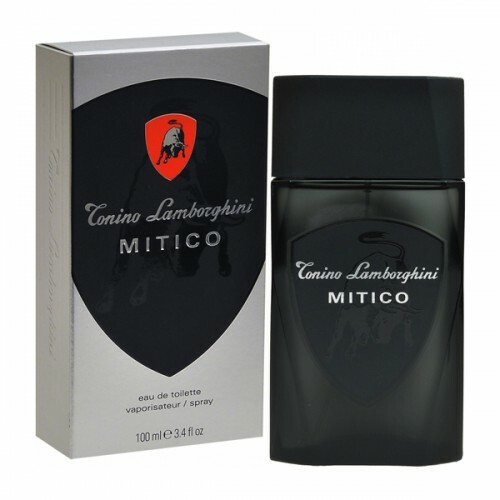 Tonino Lamborghini Mitico is an invigorating fragrance for the man. Tonino Lamborghini Mitico 100ml. Eau De Toilette is a fragrance for a passionate, sensual men, who belongs to the group of oriental fragrances. Mitico song was composed by perfumers Beatrice Piquet and Jean-Charles Niel famous perfume brand Tonino Lamborghini and released for sale in 2008. To top fragrance notes include citrus enchanting notes of tangerine and refreshing notes of blue mint. Heart notes are spicy notes of nutmeg. Base notes constituting flavor trail, the perfumer chose a warm, warming notes of Virginia cedar and sensual musk notes entailing. Mitico embodies the image of the one who makes himself and is not afraid to be the leader. He is ready to test their strength, check yourself for strength and to win in that win no matter what! He chooses his own path, which can only move forward - to their cherished goal! Mitico is perceived as very pleasant by the consumers. So the men's perfume is ideal for the day and the evening hours. The aroma of the year 2008 is characterized by the enveloping warmth and an aura similar to the oriental fairy tale. Without a doubt, it will surprise and charm you with its carefully chosen bouquet, complements the image of this man and gives his wealth and grandeur of the East. The effect is almost the same as the use of elegant eau de toilette.